Bake the chocolate cupcakes according to the package directions, using blue cupcake liners. Remove from pan and allow to cool completely. To prepare the frosting, combine butter, icing sugar, and milk in a bowl. Using an electric mixer, beat on medium speed and gradually increase to high speed until mixture is smooth and form stiff peaks. Add blue gel food coloring and stir until evenly tinted. Use a piping bag to pipe the frosting on the cupcakes. Microwave candy melts and coconut oil in 30-second intervals or until completely melted. Cut each ladyfinger cookies in halves and dip each half into the melted candy to coat completely. Arrange flat on the prepared baking sheet. Place 1 or 2 candy eyes on each coated cookie and allow to set. 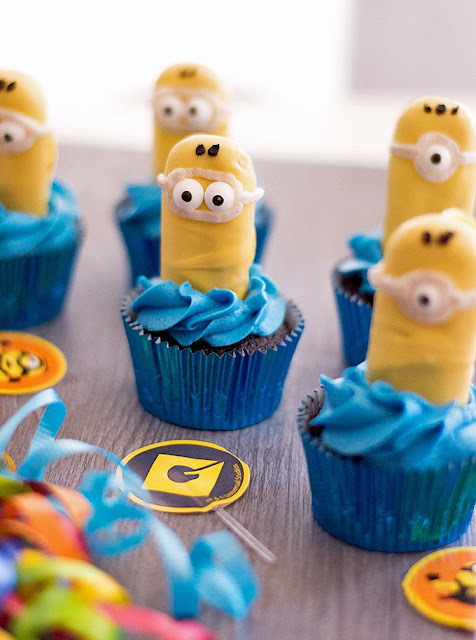 Using the black frosting, draw hair on the Minions. Insert each Minion into each cupcake.